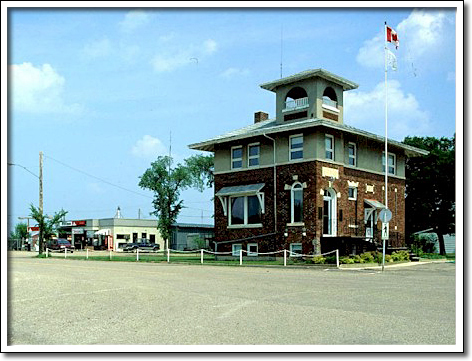 As Manitoba’s young communities took shape in the late nineteenth and early twentieth centuries, a variety of public services were quickly added to the building fabric: a fire hall, perhaps a police station, maybe a jail, and of course a town hall. The Rural Municipality of Pipestone was incorporated in 1893 but it was not until 1917, with the construction of the Pipestone Municipal Building, that a formal civic presence was created for the citizens. Brandon architect William A. Elliott and builder A.H. Bushy of Reston created a fine brick structure. Elliott's design is unusual for this type of building; where others were often based on the Classical Revival, with columns and this and that, this building is derived from the more informal Italianate villa style, with its broad roof overhang and corner tower. The building is an elegant expression of the municipality's pride and confidence.